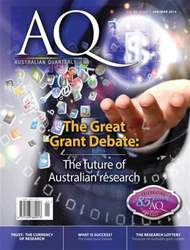 (1 Customer Reviews) | Write Review 4 issues per year For over 85 years AQ has been packing its pages with the country’s most distinguished and passionate thinkers, tackling the big issues in science, politics and society. No journalists, no bias, just in-depth and independent analyses of the topics that are shaping Australia. With longer-style articles written by the people at the forefront of the debates, AQ is unique in bridging the gap between journal and magazine, combining the compelling writing of a glossy with the intellectual rigour of a journal. If it matters to Australia then it matters to AQ. Know science, know politics, know Australian Quarterly. In 2014 AQ celebrates its 85th birthday, cementing its place as Australia's oldest current affairs magazine. To celebrate we have put together special edition that no scientist can miss. Dubbed 'The Great Grant Debate' AQ looks at the state - and the future - of science funding in Australia, attracting the most important voices on the topic. What at the system's strengths? What are its weaknesses? And what does the future look like? For over 85 years AQ has been packing its pages with the country’s most distinguished and passionate thinkers, tackling the big issues in science, politics and society. No journalists, no bias, just in-depth and independent analyses of the topics that are shaping Australia. You'll receive 4 issues during a 1 year AQ: Australian Quarterly magazine subscription. Top Mag for Australian Politics, used to read this back in Oz, very high standard of political reporting. You'll receive 4 issues during a 1 year AQ: Australian Quarterly magazine print subscription.